We have been snookered in just about everything but the kitchen sink in these last decades, why not the U.S. Constitution as well while we're at it? 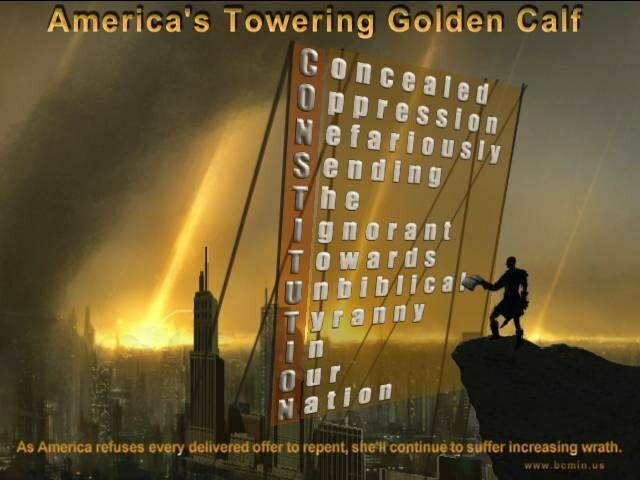 Have we discovered America's Golden Calf ? ...and sitting right under our noses the whole time? us out of YHWH's graces and protection? get rid of the God that would keep you from abusing His loyal people. or the God of the universe. loyal people into disobeying and disrespecting this God. nation by nation, enslaving the world. loyal people to denounce and/or belittle Him. to such 'voluntary' slaves from there on out. why their God is no longer protecting them ! situation only endlessly continues to get worse and worse, because again... they've been tricked into thinking that their national documents are somehow also "inspired" by this same God as well, even though they have never really taken the time to read these documents with any diligence and/or seriously compare them to their God's Bible! Are we stepping away from today's golden calf system? If we all did, the criminal cabal system in this nation would likely collapse completely under its own weight almost the next day. Can we see our way clear to understanding this last layer of deceit without "losing it" altogether? How many balloons must be burst for us in our rosy-colored lives before we, as mere mortals, feel that there is simply too much "upside-down stuff" to have to face now? The truth about 9/11, the Federal reserve, the 501c3 church snare, the chemtrails, the vaccinations, the fiat money system, the birth certificates and the strawman lies were all hard enough to take for all of us, but now? Even the Constitution is a deception from the pits of hell as well? About eight or nine years ago, the curiosities began to sharply poke me in the conscience that something wasn't quite what it seemed to be with the Constitution. But being a human document, I didn't think much of this feeling, knowing that man was imperfect. So at first I just shrugged it off. Over time, those nagging thoughts in my heart continued to grow. Some initial thoughts were serious ones, which began to lure me away from my previously-held belief that the Constitution was somehow even "inspired by God". In the years to come, the progression of my catching on to this would start with wondering why they hadn't included the names of the Father and Son, and even more puzzling to me (knowing over those years that the sacred names were somewhat shrouded in the dark ages history) was the harder to understand fact that the Bible itself was never mentioned in this Constitution as any kind of referee method. Yet little did I know those years back, that this was just going to be the tip of the iceberg for what would later come, and just as the prophecy of the Bible would surely have it fit right in at the most needful time in our own remnant's previous studies in the realm of law (or so it now seems) where the sprouts of a new kingdom of YHWH seems right around the corner for those who are truly tired of satan's imitation version of law. We have already devoted some writings and shows pertaining to this subject of "a Constitution born evil" on this website, where the "founding father's" dreaded disease of "Freemasonism" is exposed here to some depth, and where some of the law issues they corrupted for us are mentioned here and here, but the biggest part remains that I feel that I must start a page to just deal with the actual biblical problems with America's zombie-like obsession with the Constitution itself, thus this page on "America's Golden Calf". Please bear with us as this section grows. Oh and... We can always use help in either the national programs we have going, or in our local Pittsburgh area if any of you have a heart to do some volunteering in the spread of this great new hope of a renewed Puritan-styled "perfect law of liberty" for mankind (this is where other preachers would shamefully preach on how the sheep are supposed to help the one shepherding them, hint hint). The four men facing off in the presidential election could only be there today because of how our Constitution has allowed America to evolve. Professor Akhil Reed Amar on what our constitution really says about religion and race. A religiously neutral Constitution should not be confused with an anti-religious or anti-Christian Constitution. My preaching and writing about the U.S. Constitution has not been about exposing the Constitution so much as it has been about promoting Yahweh’s law and advancing His kingdom. Following salvation and personal discipleship, these two issues should be paramount in everything we do as Christians. We have been called to be ambassadors of Yahweh and His kingdom (2 Corinthians 5:20). Consequently, we need to move beyond merely the understanding that Yahweh’s kingdom and laws are integral to the New Covenant (Colossians 1:12-13, Hebrews 8:8-10). We need to move into action and start taking some ground on behalf of our King. Would YOU want to have been found standing around the golden calf when Moses came down off the mountain? Or would you want to be out of that line of fire? "WARNING WARNING: STEP AWAY FROM THE GOLDEN CALF!" Consider this as well: When we learned the story of the Exodus and the golden calf in the Bible as sunday school students, etc, many of us were curious as to why folks of the past would simply worship a cow or calf, right? I mean, my thoughts as a child had been... "Wow. Its just a cow. Who would be dumb enough to worship a stupid cow?" and yet, knowing that I perhaps didn't yet fully understand what was going on in that story, I nonetheless let it rest in my mind, figuring that someday I might understand their motives with greater wisdom when I grew up. Well, that long-awaited day is coming around as we are learning that the Egyptian system of society was not that much unlike how today we have half the American nation worshiping a donkey, and the other half worshiping an elephant. Now that we not only know how to read their hyrogliphics but also know about the secret society underpinnings that today still follow this interesting golden calf nature to some extent, it seems their golden calf was what represented their pagan societal religious/law system, of which over time the ancient Israelites had gotten very accustomed to living under during their captivity. Do we in America really "worship" the donkey and elephant ...or do we say that they are just the symbols of the system by which we have been so successfully conditioned to trust in? I would posit that because the entire system is built upon man-made laws, acts and legislated edicts that are also clearly based on humanism and pluralism, etc, that such edicts are without question in opposition to the Father's laws ("thou shalt not kill" vs. abortion, etc) whereupon the Father has all unequivocal justification to also classify our own donkey and elephant as being "worshiped" by those who today "dance around" these animals in support. It is an idolatrous system, be these animals mere symbols in their eyes or not. In having done more research on the ancient Egyptian society and Scripture, I am going to step out on a limb here and say that the Israelites at the foot of Mount Sinai (who had then themselves just been learning that they had been misled and were being called by Father's mercies to come out of their enslavement as we are today) were likely a lot like how Americans of today have become, which is that we in America have been learning that we too have been foolishly following a symbol (either a donkey or elephant in our case) that stands for a now fascist/socialist-type of society that we really should have never adopted in this so-called "biblical" nation either. The 'golden calf' of Egypt had therefore simply represented their time's early societal equivalent to today's communist type socialism, being that time's tyrannical Egyptian system of "sharing the wealth" (with the greater wealth at the very top of course) where the now murmering slaves (in their minds) at least had a consistent promise of a bite of bread and a roof over their heads each day for their labors. In the long trek of the Israelites travelling in the wilderness, the transition to what might have been complete freedom of providing for ones' self was likely too much for most of the then "conditioned slaves" to handle, and in knowing no other way, they began to yearn to go back to the less worrysome routines of their "golden calf-conditioned" consistent lifestyles, not yet having understood the Father's better system of law and justice at that point. There were probably minor skirmishes and abrasive issues for these travelers after leaving Egypt where a problem resolving golden calf system might have been little more in their minds than a near instinctive reaction to these issues, and I would think it to be especially true in trying to find peace between clashes of naturally occurring groups like perhaps for example those of the more productive Israelites vs. the less resourceful or less-productive Israelites. As they travelled across the wilderness, and before reaching Sinai, they had little if any idea of the law system of their forefathers from the times prior to the captivity in Egypt, and thus the multitides of the less fortunate perhaps wanted some fairness or (as they were likely used to viewing it) governmental "law and justice" in their midst, looking to the only system of such fairness that they knew at the time, "the golden calf system". This inanimate image of a cow would have been somewhat like our modern donkey or elephant. They had then essentially thereby created an opposing system, a "second choice" "party" if you will, opposite the God/Moses party ticket. We could then see our own party division in America and imagine (and just for the sake of illustration, mind you...) the more productive and conservative of the Israelites at the foot of mount Sinai would have likely sided with Moses and the Levites, while the multitudes of those who were used to the constant provisions of the past slave masters (and perhaps those not as inventive, resourceful or motivated), likely at times yearned to be back in their previous slave like system due to the fact that their modest provisions would come every day without them being expected to try and find new ways to attain food as this new life in the wilderness was now challenging every individual with. Today's similarly conditioned Americans can't stop dancing around their donkey or elephant in a similar fashion (can't let go of all of their own various benefits in today's top-down [criminal] "socialist-security" provisional "bread and circus" system), and as perfectly conditioned republicans, democrats or even "paper calf" (independent) "partakers" of our own overall 'golden calf' criminal system ...they simply keep blaming one or the other (as they've been trained to do by the elite) for all of the chaos and turmoil that is now taking place as a result of this now-imploding system. The already alert of us are instead trying to beat the coming chaos to the gate and wake as many remaining people as possible to the fact that the entire system of satanic enslavement and its willing partakers is the problem, not just one party of it or the other. Perhaps we can wake enough of them before famines or shooting wars begin. The results of properly "preaching the kingdom of God" as Yeshua Himself called us to do, is to successfully educate and rally our time's Scripturally-ignorant people around the concept of that "Book of the Law" again, in an embracing of the Father's true law and justice system, hoping to bring about a peaceful, wholesome, free lifestyle under YHWH once and for all. Unless we then wake the others to come out from among this beast, the numbers of those from our families who will then be hid from the coming bloodshed will be small. The sooner we all step away from this wicked system, the sooner the Father might have mercy on us as a nation. So those who are not taking any time to hear about these issues as to why we need such biblical reform (especially the so-called preachers and church leaders who should have been the first ones to be doing so and who are only acting like Jesuits themselves)... should be publicly shamed, as they are a big part of the problem holding back the Father's mercies for this nation (see article), not the elite, as the elite were sent to punish those very people who refuse to repent in the first place, where then we and our loved ones have to suffer along with them till these "troublemakers" do wise up. Many modern churches and preachers will often just smile and say something like, "live and let live" regarding all of those who are still sinning in outright arrogance towards the Father. But think about this: If a nation of people like yourself were suddenly forced to live in a gun powder processing plant and others were carelessly tossing lit matches around "having fun" all around you, how long would it take before the smarter of you might wrestle such immature and irresponsible people to the ground to save your lives and loved ones? Its no different here my friends, for as I just mentioned, its the willfully ignorant and the impenitent that are the ones that are really calling this wrath of God down upon us, not the elite, as the elite are actually and presently just the decided punishment that is now being sent upon those nations who are refusing to repent and reform their people, nation, and churches. If we can't shame the outright ungodly we know, and if we haven't been working to rebuke the many obvious sinners in our neighborhood... Can we really blame the Father if a powder keg then goes off in our midst, as is about to happen to us now? --the likes of which we've surely never seen before? Idolatry is no different a sin my brothers, its a sin just like all the others. In fact the Father seems to hate idolatry more than the other sins, evidenced by the way the Bible shows how He dishes out His wrath for it in so many cases throughout history. The multitudes of lukewarm and antinomians still don't think the situation serious enough to repent of their disdain for Father's law. And although they are the ones that this wrath is clearly first intended for (those professing to be of the house of God but who also won't reform their house; see Ezekiel 9:4-7), it is still we who may have to watch them all suffer, being themselves those who "would not that [the King of kings] should reign over them". Are we really ready for Luke 19:27 and its coming mass carnage? Remember: The elite want a shooting war, and both the heathen and the lukewarm are falling right into this trap just like Isaiah 31:1-3 says will happen to those trying to fight the beast without the Father's counsel or blessings. If you're already helping to awaken these people as we are, then know that our prayers are already with you my brethren. If not, then our prayers are that you will be able to speak boldly as Paul sought the strength for in Ephesians 6:19,20. "...Repent: for the kingdom (government) of heaven is at hand." The unstudied Christian on his way to praise the Constitution at his local town hall (without the Father's blessings), and wondering why he's not able to save the country after so many years of trying to do it this way. They refuse to believe that their man-made document is a part of the problem. The Father is offering us again here lately, more wonderful advice and information to prove what I have increasingly been trying to say for a few years now, but rather than "having a love for the truth" (2 Thessalonians 2:8-12) where folks might have eagerly wanted to look into what we have found and what the Bible might have to say about this, they simply repeat blanket statements that they were successfully conditioned to say by the powers to be, thereby automatically and sadly defending their (make-believe) two (or three) party servant system. The same system that the servants laugh at anymore, etc, and they therefore do not see the real spiritual war behind all of this. Therefore this will play out just as the Bible had warned for those who are too wise and too busy for Father's ways, where just as the Bible says, they are "willfully ignorant" (intentionally avoiding what the Father is saying about such things). In having received a growing number of emails of despair and doom and gloom from folks all over the nation who's plans are failing and who (at the same time) don't want to stop idolizing their man-made (and thereby contradictory law system and humanist solutions) please note that I am not "chastening" you here, but would only suggest to you then, that you are only causing me to feel sorry for you when you send me those messages of despair, even if you are just perhaps speaking out loud to me in hopes that I will agree with your sorrow, as you continue wondering why your unbiblical plans are not working in your corner of the world. But this does nothing but make me realize that whatever little love you may have for YHWH is perhaps only lip service for my sake at best (again, perhaps). One had written me claiming that "the Bible is about good and evil", but yet that same soul holds an immovable stance on America's man-made document of "good v. evil" laws instead of stopping to consider Father's document of good v. evil Laws whereby they might actually then compare the two to see who they actually honor. Those who are (just like Acts 19:28) crying out, "Great is the Constitution of the Americans" are doing just what the writers of that document wanted their slaves to do all along, where they are thereby living in their double-think world of believing that Christ can be your savior, but "man's legislation and politics is your ( - ahem - ) more reliable savior". Have they not even seen by their servants arrogance that their man made laws don't even have any "power" behind them anymore? Those folks are missing the "higher power" picture of that "good and evil" that they say the Bible speaks of, that warns us in dozens of places against putting our trust in "man's solutions" as if man and his law-repairing skills are somehow going to be one's salvation. The Constitution in not just unbiblical, it supports another religion altogether (and this even bolstered by a supreme court ruling from 1961). But if folks don't want to hear about this, then that is their choice, as their man-made documents are doing exactly as they were designed to do—trick them into subconsciously thinking man knows better than YHWH when it comes to "good and evil". We, on the other hand, are getting very excited about what we see on the horizon. But if its that much of an annoyance to the rest of you to serve YHWH with all eagerness of heart, then you are only making the Father even angrier at you guys. We now know that the U.S.Constitution was written so that the satanic elite could be evil to us. Today, that same Constitution is being ignored and tossed aside by that same family of satanists because it doesn't allow them to be evil ENOUGH to us now. And… Now that we know they could care less about our knowledge and accurate court proceedings and now that we also know that they seem to be banking on the “power” of their system, and even though I have personally spoken to Ron Paul and the others I will mention and feel that they even seem to be sincere in their beliefs in many ways, are guys like Rod Class or Gordon Hall going to be able to save us? How about Ron Paul, the occupy movement, or Edwin Viera? …are they going to save us? No. They don't have the enforcement power that my YHWH does my friends! In the Movie, “A Lamp in the Dark” please note the way that the Jesuits are always angrily trying to squash and destroy the Bible, even banging their fists down on it in one scene. Why do they not do this to the Constitution if it is so much against their plans as the powers-to-be say it is, hmmm? I’ll tell you why, because the Constitution is one of their documents!!! That’s why! It’s so unbiblical that it can’t be blessed and enforced by YHWH upon anyone who admires or worships it, or even just counts on it to be their salvation! Sadly, many American idolators would rather fall on their swords, than fall on their Bibles. Subpages (1): Did the document fail us?